Ernst and Young, which rebranded to simply EY in 2013, has been around for a long time. The company has gone through a lot of mergers and acquisitions, but the company had its first components founded in 1849 in England. Since then a lot has changed, but the company has operated as Ernst and Young (or EY) since 1989. EY is a member of “The Big Four”, the four largest professional service companies in the world. The big four earned a combined revenue of over $125 bn in 2016. The company is also considered one of the best companies to work for – it’s been on the “100 Best Companies to Work For” by Fortune for the past 18 years. How do you get a job with them though? What do they look for in candidates, and what’s it like to work there? Naturally as a high powered company, EY receives a lot of applications. The company estimates that over 300,000 people applied for a little over 15,000 positions in 2016. In other words, EY has a 5% acceptance rate. The company has hired more people each year though, over 16,000 jobs are expected to be filled this year. The company’s advisory services are growing significantly, reportedly growth has been about 20% annually in recent years. As with a lot of companies, internships are a great way to get your foot into the door of a firm. According to this anonymous intern, 95% of interns received full time job offers after their program. The intern interviews were reportedly very straight forward. More than anything it was a behavioral interview, where you would discuss your past experiences. The former intern (and now EY employee) recommends staying relaxed and confident. EY treats their interns well. They receive an average of $25 an hour, and are given stipends for food and housing. Near the end of their summer program, they’re all flown out to a conference in Orlando with the CEO and other high level managers for a day of group games like tug of war. They then flew all of the interns out to New York at the end of their program to provide gift bags, as well as full time offers for many of the interns. EY prides itself on the benefits it offers its employees. Most notable is its forward take for parental benefits. If you’ve worked at the company for at least a year, you’re offered a paid 4 months off to spend with your newborn child. This applies to both maternal and paternal leave, which is pretty uncommon. The company also offers full time benefits to any employee that works at least 20 hours a week, which is quite the different approach than many other firms take. With so much debate over what type of health insurance should be offered by companies and the government, it’s refreshing to see a company provide full benefits for even part time employees. Salaries for entry level employees are also quite generous. Take a look at these starting salaries by positions. EY has offices in cities all over the country. Check out these salaries for auditing positions across the country. Keep in mind that cities have varying costs of living, so naturally more expensive cities will have higher average salaries. 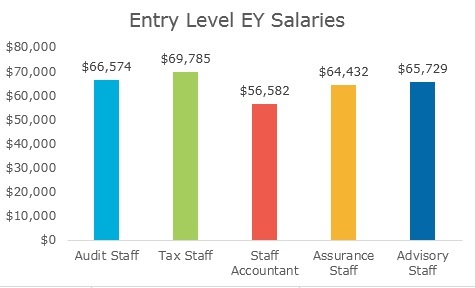 With these high salaries and great benefits, are there any downsides to working at EY? The biggest complaint that employees have is with the work/life balance. The former intern reported that some offices worked 60-80 hour work weeks, which is common in professional services. The real estate department might stay as late as two in the morning. As a professional services company, hours can get particularly long in March and April, right before tax season. Obviously all employers are going to have their own pros and cons, so it’s all about what matters to you. Looking for more guides on professional service companies? Take a look at our articles on Goldman Sachs and McKinsey. Need help finding the right company for you? TransparentCareer offers free data on compensation packages, salary negotiation, and career pathing. Sign up for a free account here.